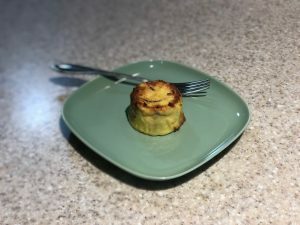 About a month ago I ordered the Anova Sous Vide Precision Cooker, available on Amazon here, with the sole intent of recreating the creamy, bacon and gruyère egg bites that Starbucks serves up. I know that purchasing yet another kitchen gadget may not seem practical, especially when you consider not only the $130 price tag of the Sous Vide, but also the jars to make them in, the tub and lid for the water bath, and the weekly, yes weekly, ingredients I’d need to purchase to keep this dream alive. But spending $5 a day at Starbucks, plus the time and gas to drive to the closest location, which I should add was frequently out of my beloved bacon egg bites, made it all worth it. I could also make a number of other tasty recipes with this magical device. Sold! My first step was to convince a coworker of mine to make egg bites at our company meetup. He already had the same sous vide and swore it was a game changer. He happily obliged and began his research. Meanwhile my sous vide sat in it’s box, silently waiting to be explored. Fast forward to our meetup where he made egg bites the team happily consumed. There was the bacon and cheese variety I had requested, and also a vegetarian option. They were a hit! I was stoked to return home and begin my research. When you search the internet for sous vide bacon egg bite recipes, the most popular result is from the Anova website. I however wanted them to be as close to the Starbucks recipe as possible, minus the preservatives. I compared the ingredients on the Starbucks website to the Anova recipe and came up with my own version which I’ll share with you below. I feel as though my version is closer to what Starbucks serves than the Anova recipe with the main difference being the texture. Set your Anova Precision Cooker for 170ºF. I allow mine to fully reach temperature before adding the jars. There’s plenty to keep me busy while it preheats. Add all ingredients, aside from the bacon, to a large food processor or blender and combine until smooth and no large chunks or lumps remain. Place a slice of bacon in the bottom of each jar. I roll mine up and stand them on edge in the bottom of the jar so they gently unroll and make a little spiral. Pour your egg and cheese mixture evenly among the jars, directly over the bacon slices. Gently screw the two-part lids onto the jars. You’ll want to tighten them so they’re securely on, but do not over tighten them or they may EXPLODE! Drop/place your 12 jars into the water bath so they’re fully submerged and let cook for 45 minutes. Remove after 45 minutes with tongs, let cool for a few minutes, and remove the eggs bites from their jars by running a butter knife around the edge. I store my egg bites in a large ziplock bag or container in the refrigerator for up to a week, but they rarely last that long. When I’m ready to reheat them, I set the oven to broil with the rack in the upper/middle section of the oven and immediately place the egg bites inside on a piece of aluminum foil. I broil ours for 20-23 minutes, but adjust according to how crispy you like the top. While I have yet to use my Anova sous vide for anything but bacon and gruyère egg bites, I am looking forward to creating additional egg bite recipes and perhaps trying my hand at something other than breakfast food.